Gratitude goes to Peter Kirk and Peter the Eater of the Airfield Information Exchange for their useful knowledge about markers shelters and gunnery ranges. 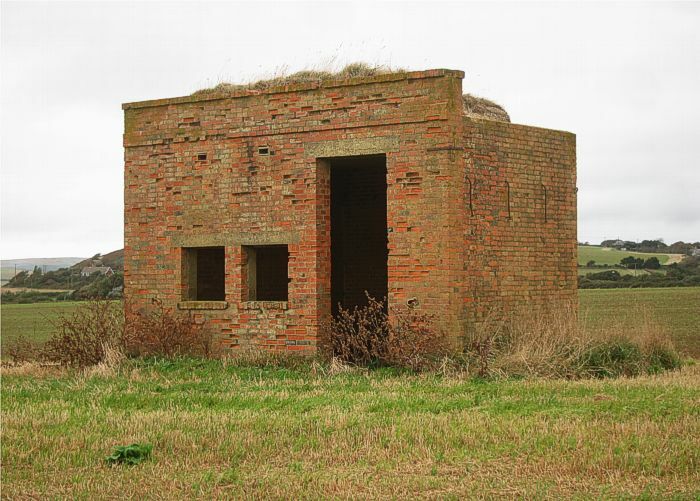 This shelter is situated on a flat area of a field, west of Chale village, in the south part of the Isle of Wight. It is about one hundred metres from the cliff edge of New Walpen Chine. It is constructed with brick elevations and a flat concrete roof. The only side with openings is the southern elevation, facing the sea: there is a 10 foot high doorway on the east side with two window openings to the west of the doorway. Both the doorway and window openings have concrete lintels. The southern elevation extends some eighteen inches beyond the line of the side walls, forming small protruding piers at each end. On the east, west and north elevations, there are iron bars that stick out from the brick face and have been bent downwards flat against the face of the brick wall. There are four equally spaced bars on the east and west faces and five on the north face. These iron bars are about two feet long and end in a threaded section with a bolt. They are positioned about 9 feet high on each face. 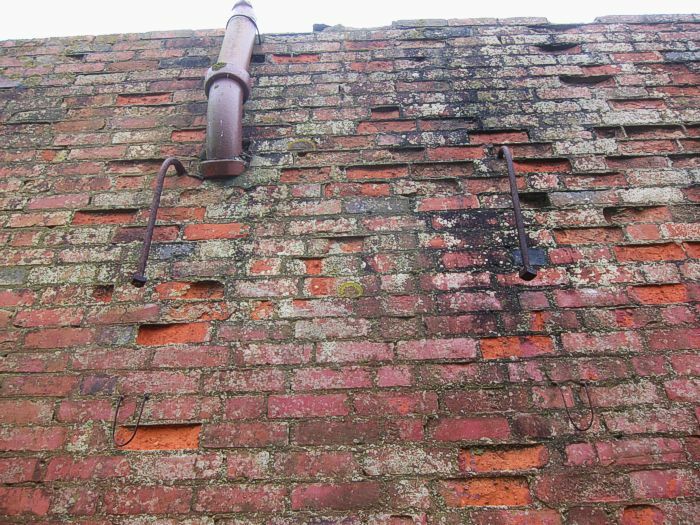 About three feet, directly under each of these, there is a curved, U-shaped piece of metal bar, whose ends have been cemented into the wall. It has a flat concrete roof, supported by one iron joist. The shelter itself is a brick structure of rectangular plan, with a concrete roof. 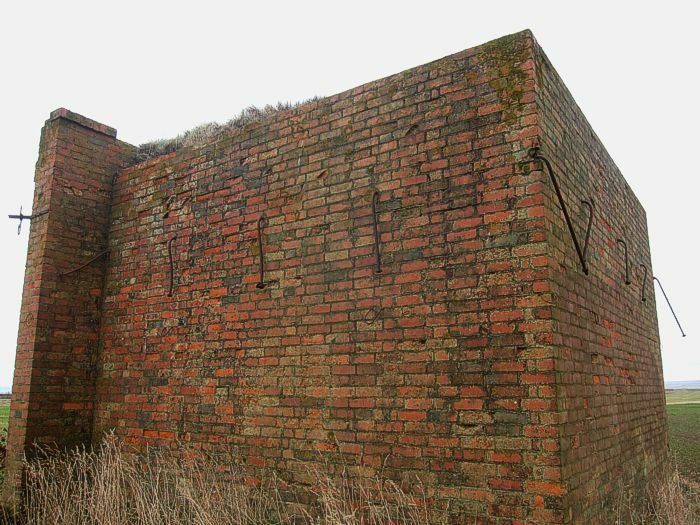 A second external timber skin wall ran round parallel to the east, south and north walls of the structure, thus forming a cavity of about eighteen inches outside the brick walls. 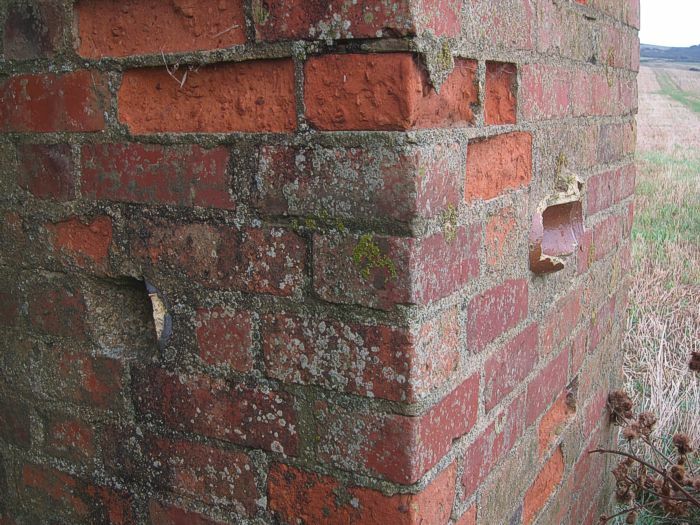 This external wall was held in place by the long iron bar bolts protruding from the brick walls and secured on the end with a nut and a square washer. The intermediate space was filled with earth or sand and then all sides, except for the south face, had earth banked up against them to provide a final layer of protection. It would seem that the roof was also covered in a thick layer of earth or turf, given the size of the parapet wall on the south elevation. There is an extant layer of turf-topped earth on the roof. The only openings are on the south side, facing the sea door and therefore safe from the oncoming fire from aircraft approaching from the north. Towards the land edge of the western wall, there is a pipe exiting through the brick wall and curving vertically upwards, ending in line with the roof. It is made from standard, glazed drainage pipe sections. 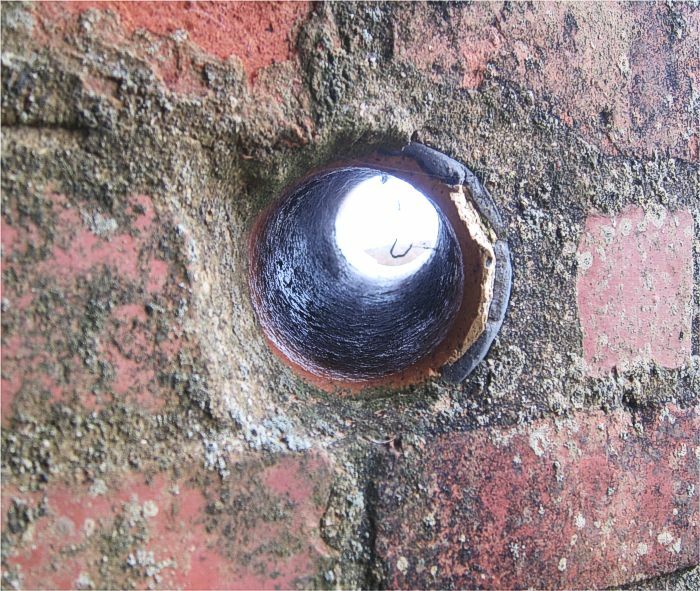 This is possibly the chimney flue from a stove inside the shelter. Air to Ground gunnery ranges were for the training of fighter planes in firing on selected targets, set up on an area close to the coast. On coastal ranges, markers shelters were situated close to the coastline, so that any stray rounds passed harmlessly out to sea. 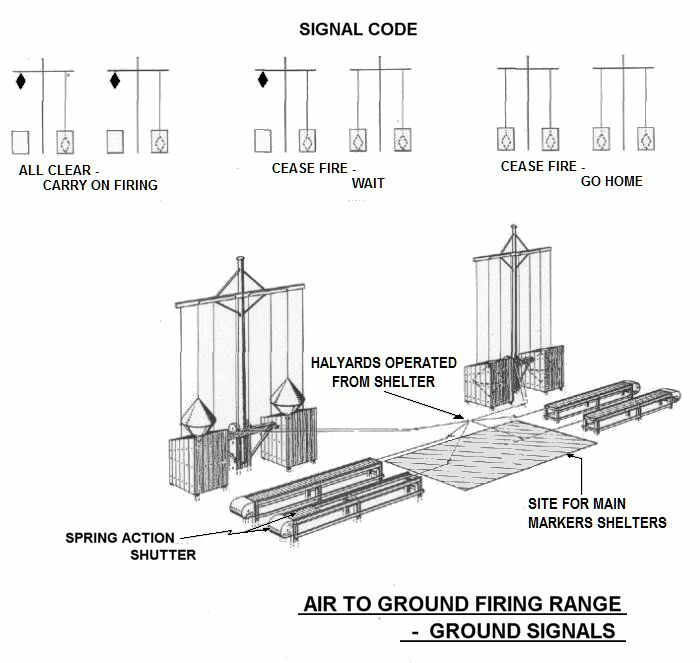 The targets were ten feet square and were set up in a line in front of the markers shelter. 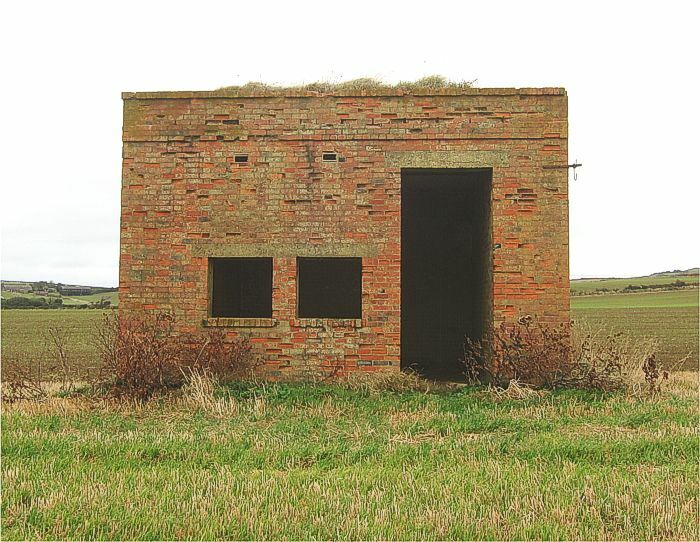 The shelter housed a marker crew, whose job was to mark or score the targets and repair any damage from inside the safety of the shelter itself. 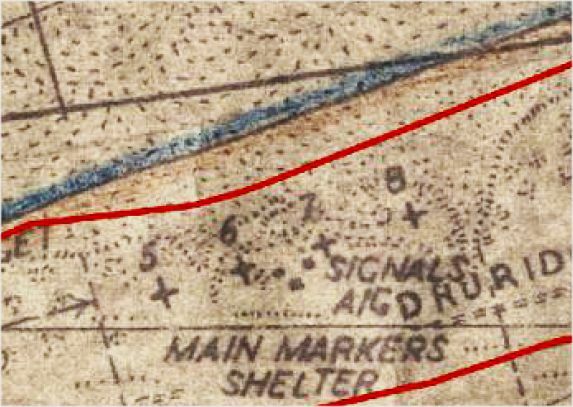 The earlier shelters communicated via signal poles, either side of the shelter, that carried shapes that were operated by guy ropes and which, through various permutations, could be used to send messages to the pilots. 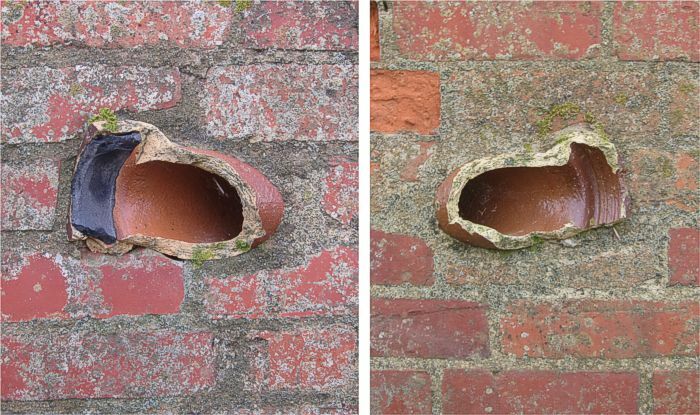 Evidence for this form of signalling can be seen at both sides of the south wall, where a standard glazed drainage pipes run through from the inside to the outside at an oblique angle. However, the Chale shelter also seems to have been equipped with a telephone, as a telephone wire bracket is still extant on the south east corner. There is no remaining evidence for signalling boxes either side of this shelter. 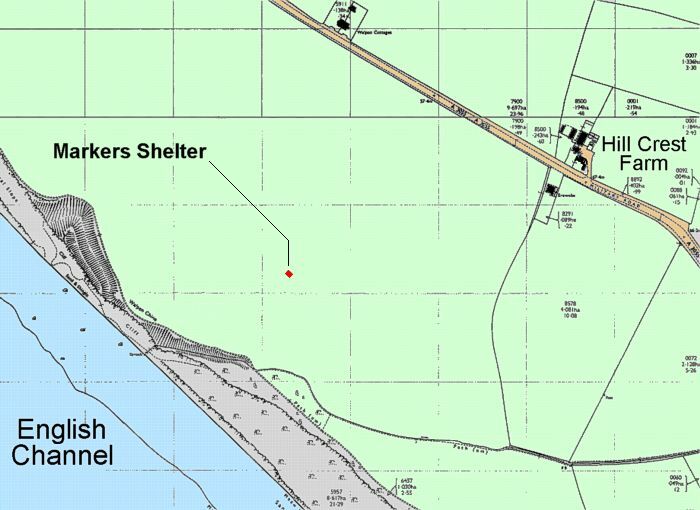 There are other examples of markers shelters round the UK. 1. Cylch-y-Garn, near Holyhead Bay, Isle of Anglesey. 5. Brandy Head, East Devon. 9. Brander Heugh, near Lumsdaine. East elevation, showing protruding brick pier, iron bolt bars and telephone bracket. East and north elevations, showing iron bolt bars. West elevation showing glazed drainpipe feature. 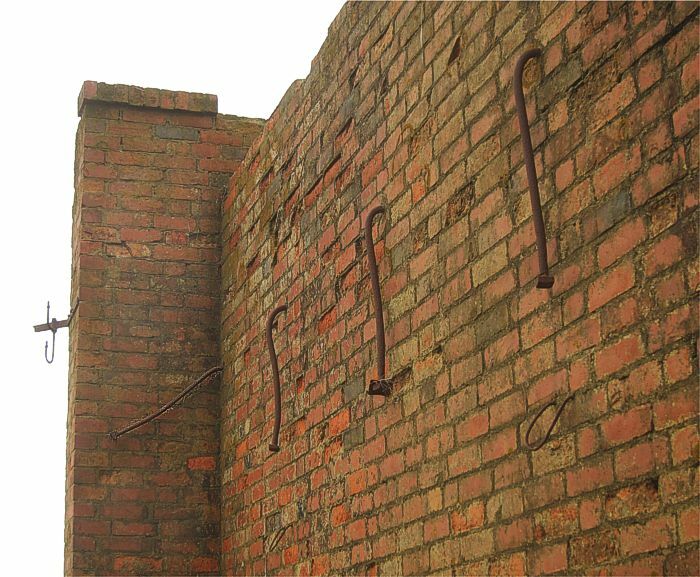 Detail of an iron bolt bar, used for supporting outer cavity wall. Glazed pipe tube that housed the guy ropes from the signal poles. West (left) and east (right) signal rope pipes. Looking through the glazed signal pipe. Diagram showing the lay-out of the markers shelter and signal posts and the various signals. 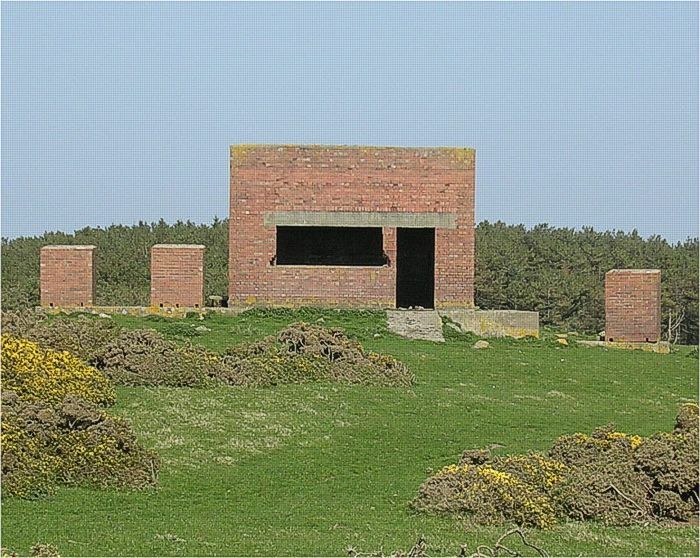 Markers shelter at Holyhead Bay showing side brick boxes for storing the signalling cones. 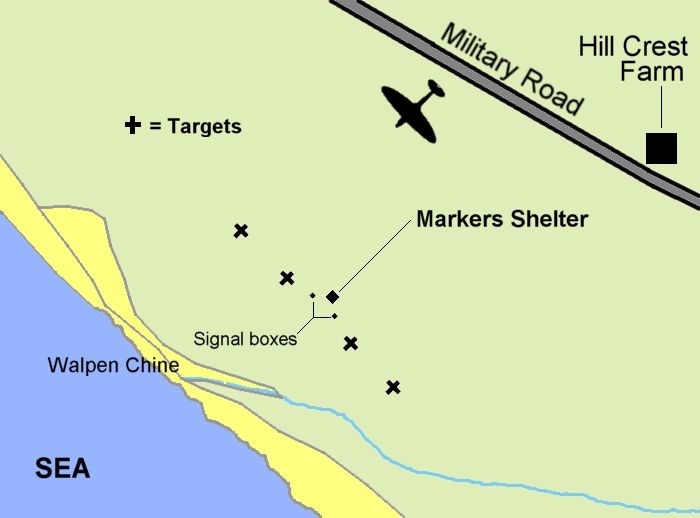 Plan of Druridge Bay gunnery range, showing typical lay-out for markers shelter and targets. A conjectural plan of Chale target area.